Without mentioning John Ruskin, or discussing the PRB’s literary associations beyond a superficial glazing, RSmith simply hasn’t done her homework or, to use her phrase, “just doesn’t go very deep.” Manet and Cezanne are not contemporaneous with the founding of the PRB (1848), but they came on the scene fifteen and twenty-five years later, in another country and at a time that was so rapidly accelerated that the comparison falls short of its intended effect. 1863 was after all, the birth of the modern era but it did not happen overnight. While I’ve never been the first to champion the PRB, this exhibition demonstrates their brilliance and proves exactly why “now” is the time to re-examine their admirable accomplishments. The literary sources of Boccaccio, Shakespeare, Chaucer, Tennyson, Keats, Dante Alighieri, Arthurian Legends and the PRB painter/poets themselves, Dante Gabriel Rossetti and his wife, Elizabeth Siddall all require a careful reading before coming to a measured understanding and appreciation of the PRB pictorial language. The satellite exhibition downstairs: “Pre Raphaelites and The Book” supports this claim. Beyond the literary references, the Pre-Raphaelites sought to create pure aesthetic beauty whereby Rossetti’s and Burne-Jones’s women are every bit as sensual as Botticelli’s quatrocento Madonnas. The PRB were the poets and social commentators of their Victorian epoch and just as Shakespeare used ancient references to comment on his Elizabethan times, the PRB referenced a medieval age of innocence and courtly love to counterbalance what they saw as the ills of the industrial revolution that turned men to machine-bound slaves. Speaking to their Victorian era by incorporating universal themes and well referenced narrative sources from the profound, mostly English literary tradition, themes appear from Shakespeare’s “Hamlet,” “Measure For Measure” and “The Tempest;” while Dante’s “Divine Comedy” is revisited by his namesake Dante Gabriel Rossetti. 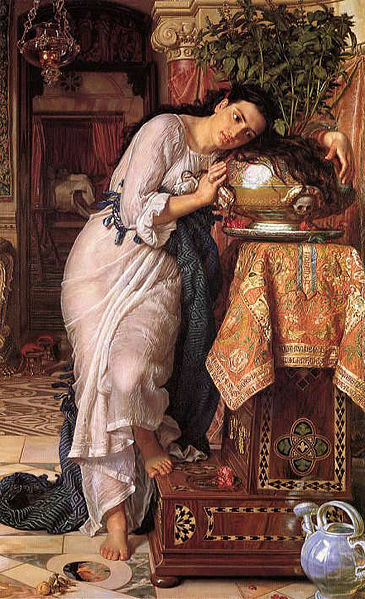 An especially provocative theme from Boccaccio’s “Decameron,” revisited by the poet John Keats is the source of inspiration for the painters: John Everett Millais’s Isabella and Lorenzo (not included in the exhibition), and later, William Holman Hunt’s Isabella/The Pot of Basil, one of the finest paintings in the exhibit. These are not only beautiful paintings to look upon, but they possess layers of literary narrative to contemplate while one is drawn into the painting’s pure aesthetic beauty containing clean lines, saturated color, soft light and careful articulation of the interior space that is not only physical but cerebral and emotional. The most famous work in the exhibition, Millais’s Ophelia is based on Shakespeare’s ill-fated lover who was cast away by Hamlet and in her melancholic state, helplessly succumbs to drowning in a shallow stream. 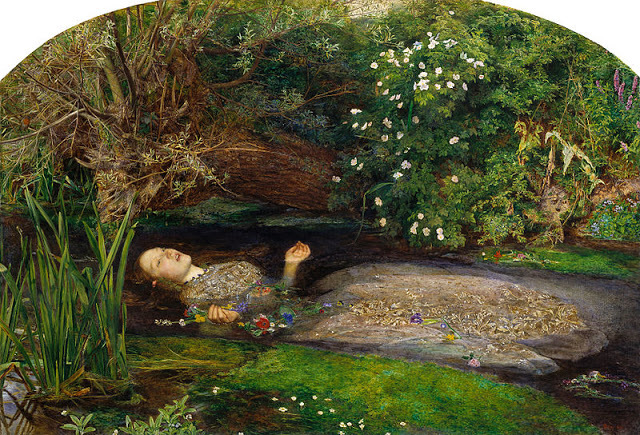 Shakespeare never showed the death of Ophelia in his theatrical staging of “Hamlet” but the artistic license and poetic interpretation taken by Millais, is reverential, referential, poetic and visually masterful while on par with the great bard himself. The NYTimes review reads like something encouragingly written fifty years ago for Horst Woldemar Janson’s art survey class (aside from the Thomas Kinkade reference.) While today’s art has returned to some traditional roots of formal image making, you would never know that by reading the NYTimes article. Art today has welcomed back painting, reintroduced the narrative and the human figure and what went out of vogue in the early 20th century with modernism’s arrival, has returned in full force. So many banished 19th century paintings have been taken out of purgatorial museum storage vaults and we can once again appreciate Millais, Hunt and Rossetti, but now hung in the same museums as Manet, Cezanne and Van Gogh. There is no need to compare the PRB to Manet, Cezanne and Van Gogh and certainly not appropriate to interpret them using the same visual criteria. John Ruskin wrote meaningful essays about Pre-Raphaelite art as early as 1850. Taste, like fashion comes and goes, but the PRB is back standing their ground after a century of neglect and shunning. Post modern interpretations about a pre-modern era sheds very little light on visual matters and always requires more seasoned responses rather than stock summaries. I’m reminded about the rediscovery of Botticelli, Vermeer, Rembrandt, and Louis Comfort Tiffany, four artists who went out of style late in their lives. Each came back because tastes change and what air led to their being ignored transformed as I sense will also occur with the PRB very soon. Sorry but I agree with Roberta. There are a few good things but mostly it’s dreadful. The only complaint I can make of her article is failure to register the PRB’s obvious lineage – it’s pure Romanticism via Blake’s medievalism – even the name deliberately echoes The Nazarene Brotherhood, an earlier collective of mainly German artists in Rome. But none of them had Blake’s vision or daring. Avant-Garde? A fairly cautious, terribly English version perhaps. They’re the meek and tedious craftsmen that are the terrible revenge art takes upon British Art right throughout the 19th century, for ignoring Blake. Serves them right. Critics don’t object to the popularity of this tepid stodge, but as Smith rightly points out, its low road to poor taste. Next stop Maxfield Parrish, Alphonse Mucha, all stops to Norman Rockwell and Walt Disney. Thanks for posting this. The painting of Ophelia inspired one of my own paintings. I would love to be able to go see this show–I love the National Gallery's permanent collection, and I would love to see these paintings as well. Everyone is entitled to their opinion, but I fail to see the value of art criticism when it becomes reduced to snarky commenting, as in Roberta Smith's article. Sorry, this is the illustrations of gothic novels, soap operas. Its what rich socialites do, because they don't work and don't have anything else to do with all the time on their hands. I can see Paris Hilton in the first print. 1848 is the time of Karl Marx, people in the streets of Germany and France, being shot just because they wanted to be off from their sweatshops and able to spend Sunday mornings with their families. These pictures are the epitome of the bourgeoisie that were so reviled by Marx. They are empty of meaning. Looking at Millais' Mariana, how on earth can anyone call or refer to that as 'stodge'? It is painted beautifully, the colours achieve a fabulous richness, especially the blue sin her dress, it's full of symbolism and messages and comments that would be immediately relevant to mid-victorian English society and it still sends some of these down to us through time… On a wet afternoon in London, the room at the Tate that contains the Pre-Raph's, will be well attended and you will notice people almost transfixed by these amazing artworks. I've never been wild about this stuff either. These paintings have always come across as standard 19th century book illustrations (that is, work that cannot stand on it's own). Thank you so much for posting this thoughtful rebuttal to Roberta Smith's review. As Thomas Germano has correctly described, Ms. Smith's critical paradigm is hopelessly rooted in the the reductive materialism of 20th century modernism. I'd have thought that postmodernism would've liberated art-writing from the stifling limitations imposed by this worldview, but oddly it seems only to have entrenched it further. Can PRB work come off as saccharine and overly sentimental? Certainly, but these qualities are often accompanied by a gauzy, dream-like otherworldliness. The best of these paintings drift along lazily in the tidewaters that demarcate the waking world from the world of the 'spirit'. Sadly, critics like Ms. Smith, and the other Brahmans of 21st century art are simply ill-equipped to detect, let alone lucidly describe these aspects of art. The PRB is the most authentically British of art movements. The whole of 20th Century English painting owes something to them. Without them neither Stanley Spencer nor Lucian Freud would have had the proper ground on which to develop. Excellent article! Thank you for the comment. I've just seen PRB in Moscow. Getting closer to the pics isn't easy because of the crowds. And we also have a new book of PRB poems (both English and Russian)to sense the atmosphere. Sadly but some reviews in top print media echo Roberta Smith attitude.